Update: there are now videos (screencasts) and audio of the talk available on the Mozilla blog. I am currently at the Webvisions Event in Barcelona, Spain and tomorrow I will give a talk about “HTML5 and the future of the web”. To spice things up a bit, as I enjoyed watching The Lorax on the plane and seeing that a lot of people at the conference are parents, I thought it would be a good plan to write my whole slide deck in Dr.Seuss rhymes. This may go down immensely well, or fail horribly, but you got to take chances. The talk (with a few extra slides) is available on Slideshare, as a PDF on Dropbox and as a styled HTML version on GitHub. Also thanks to Eric Shepherd for some rhyming help. and it broke all the locks. and a shiny new knight. to join them in song. was the promise it brings. Bah, standards! Who needs them? kicked them out of its bed. paints a much better . bring many a new tool. are what people like to do. which is a reason to clap. and Mozilla Popcorn makes that a snap. it gives you just that – even today. that it has such a long name. and it is called WebGL. and respond instead of despair. you can mimic this – nice! so there – take your coat. and do you want to chat? even to show off your cat. as you just became aware. this was just too much to bear. and HTML5 gave us that. All in the client, it’s mad! and create them – easy to maintain. with third party buttons abound. let’s not have them around. so let’s not break it in its stead. and they will work – there’s no doubt. But will they be readable by others? or your friends who are the same. so make sure you’re not to blame. if you don’t know its depth. should be your first step. and use it to enhance. IE6 walks – it can’t dance! but don’t expect to go steady. It’s your very best bet. build a web that will last. and stop building for the past. We have to move it forward. or else our existence will cease. 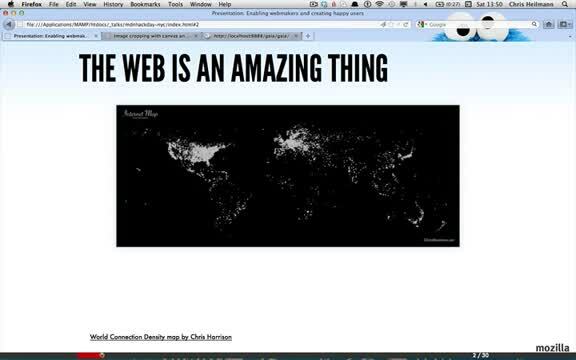 if you like the web – you will like it – no doubt. this is how things get done. come on, show us you care. Whenever there is an open forum to discuss HTML5, you get very interesting questions. Sometimes you also get ones you just facepalm to. One of them was yesterday on Facebook where someone wanted a “simple web in HTML5”. As I was bored watching “revenge of the sith” I thought I give it a go. So here you go – a simple web in HTML5 canvas. I translate the context of the canvas to the centre of the 400×400 pixel canvas and start painting the lines. I paint one line from 200/200 (which now is 0/0 as the translation happened) to – 30/- 200 which is the top left. I then paint a quadratic curve to the top right of the segment (30,-200) with the curve point being in between the two. I then move the canvas “pencil” to the other points on the left and draw quadratic curves to their counterparts. All of these I set with trial and error – I am sure there is a clever algo to do this, but this works. And that’s that – a web in HTML5 canvas.